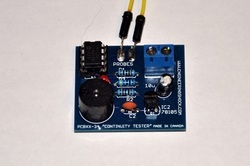 This listing is for a continuity tester kit that can be used to test circuitry for short circuits, and low resistances. It is very easy to put together, and the video above offers a full demonstration, and step-by-step assembly instructions. B) Flash the indicator LED when resistances between roughly 2-100 Ohms is measured, to indicate a low resistance path. C) Turn on the on-board buzzer to indicate that less than 2 Ohms is being measured between the two probes. 2) All of the components necessary for assembly, minus the wires required for probes. All you need for probes are two pieces of wire. Note: This kit DOES NOT come with any hard copy schematics or instructions. All you need is right here in this listing.